Ruby Ring | A nice gift, too nice perhaps? 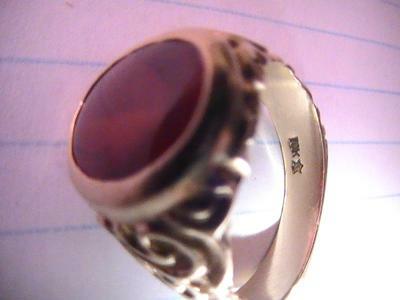 I recieved this ring as a gift, it is stamped 10k with what looks like a star with a c or a g inside, it looks like a 6 point star but i dont have a magnifying glass. The ring has a ruby set in it, the underside of the stone is cut but not polished because i can see the tool marks, so i know it has not been moulded. The gold is a lighter color almost white like a brass. when i got the ring she told me her parents used to collect stuff like this for a hobby, they are passed on now, but i am interested to know the origin and the authenticity.